At Book Expo America, I made it my mission to get a copy of the sequel PRODIGY. I got, read it, loved it. In PRODIGY, the elector primo dies, leaving his son Anden in charge of the Republic. June and Day owe their safe passage to the colonies to the Patriot rebels who charge them with assassinating Anden. But once June gets to know Anden, she wonders if Anden might be the right one to lead the Republic after all. Meanwhile, Day struggles with the class and upbringing differences between him and June. I had no idea where the story might go after LEGEND, and PRODIGY was full of new, exciting developments. The twists are massive (thus the Zombie Chicken Merit Badge for Twists) and the end was so heartbreaking, I am still recovering. 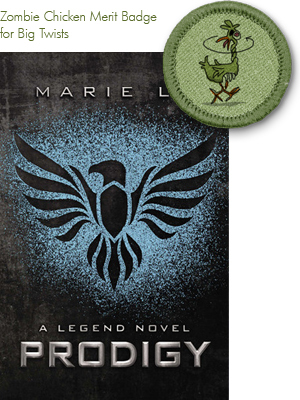 PRODIGY doesn't come out until January 29, 2013, but thanks to the publisher, I have 3 ARCs to give away. Each winner will also get a LEGEND/PRODIGY poster. To enter, fill out this form by August 17, 2012 at 11:59 pm CST. Open US & Canada only. Oh no US only :'(. I love twists, and look forward to reading this one :-). Glad you enjoyed it, makes me look forward to Prodigy that much more. So can't wait to read this. Thanks for the review and giveaway. I still haven't read Legend, but it's way high on my list of TBR books. I am glad to hear that this one is just as fantastic and wonderful! Just read LEGEND and loved it. My favorite dystopian now, I thought the world building and the characterization left the others behind. I love Day and June. And I would very much love an advance copy of Prodigy. So glad to find other fans. I haven't yet read Legend (but I WANT to...does that count?). I'm a mess, I can't read fast enough. Anyway, it means a lot to hear you give this series a thumbs up, especially for the second book. Glad to hear you enjoyed it. I would love to win a copy. I loved Legend too and can't wait to read this one! I absolutely love, love Marie Lu. She is my hero. Can't wait to see how the rest of America lives and all the twists to come. Excited about the movie rights being sold!